Share the post "Linden Tree Healing Properties"
Common names of Linden tree: Basswood tree, Lime tree, White tree, Small-leafed linden, Linden, European linden, Lime flower, Linden sapwood. Linden is a beautiful, long-lived tree with a relaxing scent and a lot of healing benefits. In Europe, many legends and superstitions are centered around these trees. Linden wood was used for carving sacred works of art, images of the Virgin Mary and figures of the saints. In Germany the linden tree was a “sacred” tree for people in love, the tree which brought fertility and prosperity. Read about Linden or Basswood tree interesting facts and uses. Linden tree has fragrant and nectar-producing flowers, the medicinal herb lime blossom. This tree is a very important honey plant for beekeepers. It produces a very pale but richly flavored monofloral honey, which has a lot of healing properties. Most medicinal research has focused on Tilia cordata, although other species are also used medicinally and somewhat interchangeably. Useful parts of the plant: wood, bark, leaves, fruit, flowers, sap. The dried flowers, leaves, and wood are used for medicine. Linden wood is used for liver and gallbladder disorders, cellulitis (infection and swelling beneath the skin). Charcoal made from linden wood is used to help with intestinal problems, and also used topically to treat edema or infection such as cellulitis or ulcers of the lower leg. The inner bark contains mucilaginous materials and makes a soothing application for skin irritations, boils, wounds, sores, and burns. Linden leaves and flowers are used for colds, fever, sore throat, stuffy nose, headaches, bronchitis, and as an expectorant. Linden has sedative effects and used to treat rapid heartbeat, high blood pressure, nervous tension, and insomnia, excessive bleeding, problems with bladder control, and muscle spasms. Linden is also used to cause sweating and as diuretic – to increase urine production. New evidence shows that the flowers may be hepatoprotective (flowers of Tilia argentea). Lime flower has been reported to have antifungal activity. 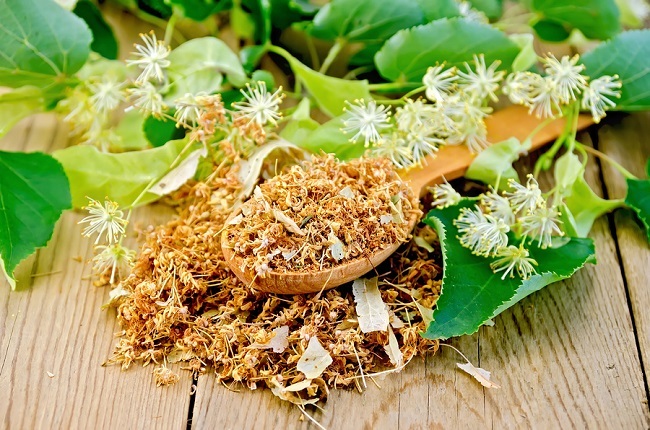 In Germany, linden is included in common cold and antitussive preparations, as well as in urological and sedative drugs. Active ingredients in the Tilia flowers include flavonoids (which act as antioxidants) and volatile oils. The plant also contains tannins that can act as an astringent. The dried flowers are mildly sweet and sticky and widely used for herbal teas. Limeflower tea has a pleasing taste, due to the aromatic volatile oil found in the flowers. Recipe: steep 1 tsp. of dried flowers or leaves in 1 cup of boiling water. Take 1-2 cups a day. For the throat: the flower tea mixed with sodium bicarbonate can be a good wash for an irritated throat or for inflamed tonsils. 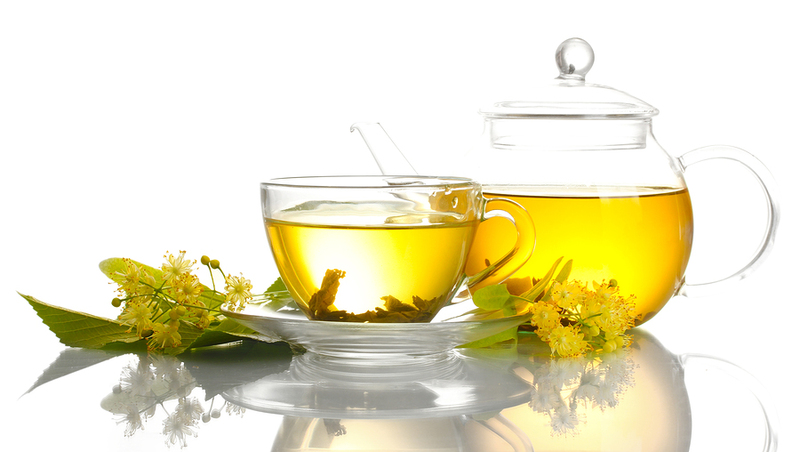 Since linden tea stimulates sweating, it is useful in cases of colds and flu to lower the body temperature. There is a legend which says that the sun radiates “trapped” in the flowers of linden, so that solar heat is transferred to the body of the person who drinks hot linden tea, so the person starts to sweat. Washing with linden tea tones and rejuvenates the skin of the face. Lime flower tea compression with cornstarch with cold water can help dark rings around the eyes. The leaf buds and young leaves are also edible raw. Warnings: the German Commission E monograph concluded that the linden flower is cardiotoxic. Frequent consumption of flower tea may cause heart damage. Dosage: No more than 2 to 4 g/day of linden from teas or other preparations for internal use should be consumed.